Rabbi Dr. Menachem Mendel Hirsch was born in Oldenburg, Oldenbg. (Germany) March 3, 1833, he died March 28, 1900 in Frankfurt am Main (Germany). He was the eldest son of Samson Raphael Hirsch, the famous Torah and Psalms commentator. 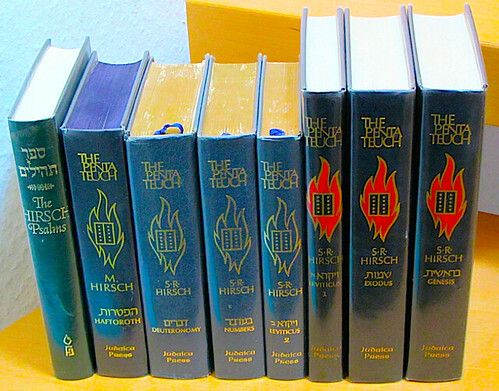 As a continuation of the (unfinished) Hirsch–Tanakh he translated the Haftoroth, the Twelve Minor Prophets and the Lamentations into German. Only the Haftoroth were rendered into English. 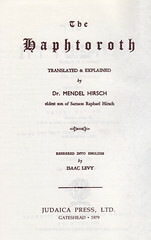 His younger brother Jehuda Julius Hirsch (1842–1909) translated and explained the book of Isaiah (German only). Comments: Hardcover octavo, sewn binding; (12), 703 & [5 empty] pp. Scripture text Hebrew/ English in double column per page, verse-wise; extensive explanations beneath. 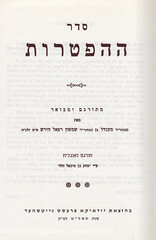 From left: Hebrew title of the „Seder Haphtoroth“. 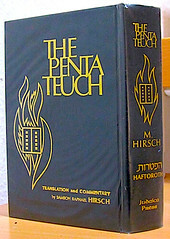 – Array of all the English Hirsch– volumes of the Torah, Haforoth and Psalms.